"Baylor Music taught me that there is more to the music than the notes on the page. There is a story and world of emotion behind every piece and behind every student." Sabrina Behrens is the Director of Orchestras at Travis High School. She has previously taught at Clements High School, Bowie Middle School, Bush High School and Garcia Middle School- all in Fort Bend ISD. Mrs. Behrens has frequently assisted the surrounding districts by hosting regional and state events including sectionals and master classes, and she is consistently in demand as a respected area judge, clinician and conductor. 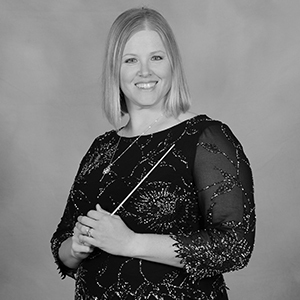 She has also served as a respected chaperone and assistant conductor to other orchestra programs in the district, having performed at locales ranging from Orlando, Florida to Austria and the Czech Republic. In 2010, Mrs. Behrens had the privilege of conducting the Clements Chamber Strings at the Midwest Clinic in Chicago, IL. In 2016, she conducted the Travis High School Orchestra at her Carnegie Hall debut. As a student at Bryan High School, Mrs. Behrens was selected as a member of the Texas All-State Orchestra in both 1995 and 1997. She received her degree in Music Education from Baylor University, and she also holds a Masters in Double Bass Performance from the University of Michigan. Mrs. Behrens has studied bass performance under respected professors Chris Buddo, Diana Gannett and Lawrence Angell, as well as conducting with Jeffrey Grogan, Michael Alexander and Stephen Heyde. In her free time, Mrs. Behrens enjoys watching ice hockey, spending time with her husband and their dog as well as training for triathlons. She has completed eight half Ironman races and two full Ironman races. She is an avid sports fan and follows the Dallas Stars, Columbus Blue Jackets, Dallas Cowboys and the Texas Rangers.